Steel Dreams sculptures are beautiful, hand-crafted, dimensional works of metal art for the home. Don Smith and Scot Hurley cut, polish and heat-treat the steel elements to create the layered compositions of Steel Dreams Sculpture. Have a tough spot in your home where the sunlight keeps you from hanging lithographs or giclees? Steel Dreams metal art is ideal for challenging environmental conditions. With themes ranging from ocean scenes to mountain landscapes to wildlife, there is a Steel Dreams metal sculpture for every home. Don and Scot met in Leaburg, Oregon, while both were apprenticing under a well-known Northwest metal sculptor. Don had a background in logging and Scot had worked in pipe bending and metal fabrication. They were both very focused on learning to translate their skills to creative metal work. A friendship was struck up, and then a collaborative partnership that became the Steel Dreams studio. This extremely physical and labor-intensive art form is done entirely by hand by the two metal artists. Cuts, scrapes and stitches are part of the package when working with sharp metal edges, but they take satisfaction in knowing collectors love having their unique metal sculptures in their homes. Both men live in the Willamette Valley in Oregon where they find much inspiration from the beauty that surrounds them. 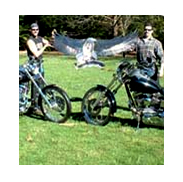 They share a common passion for family and the outdoors as well as helping within the community. They find peace and purpose through their artwork. Whether at home, with their families, in the studio, or cruising the highways on their Harleys, they are always in the creative process.